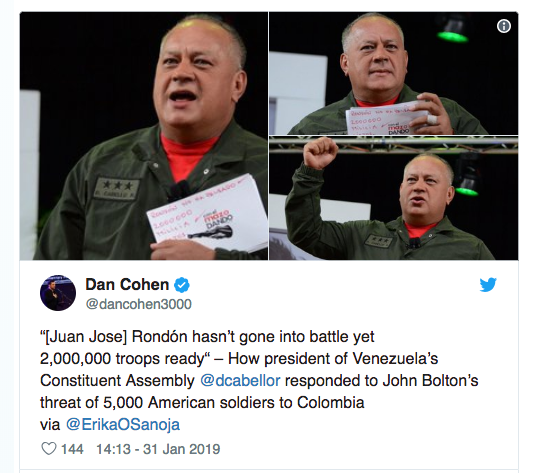 President of Venezuela’s Constituent Assembly Diosdado Cabello send a message to US President National Security Adviser John Bolton by showing a note that 2,000,000 Venezuelan troops are ready to repel a possible US invasion. On January 28th, Bolton held a briefing regarding the situation in Venezuela. During the event, journalists spotted one page on his notebook seen. The contents show something that strongly resembles “Afghanistan” and “5,000 troops to Colombia.” Many media commentators described this as a sign that the US is preparing for a military action in Venezuela. These rumors were further fueled by the formal stance of Washington, which claims that all options are on the table. Vladimir Zaemsky, Ambassador of Russia to Venezuela: "Of course, Maduro has control over the country. The thing is that all of those statements which were made with respect to dual power have no serious reason for them, in my opinion, since Guaido doesn't have any power of authority. He may try to appropriate them. But he can't currently exercise them."